Not to worry folks; the change is a good one. 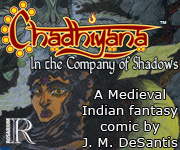 Because one page at the beginning of the book had to be extended to two pages, the Chadhiyana graphic novel web-comic, Chadhiyana: In the Company of Shadows, will begin posting on Tuesday, October 1st. That means an earlier release date and an extra page next week. Everything else will remain as it was outlined in yesterday’s post. 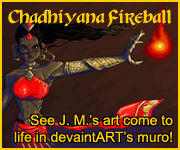 So make sure you come back on Tuesday for the first posting (the cover of the book) and help celebrate the start of a new chapter in Chadhiyana’s story (both literally and figuratively).